A year ago at this time as we recapped 2017, we summarized a euphoric investing environment. What a difference a year can make. If 2017 was positive and steady, 2018 was negative and choppy. 2018 bears the dubious distinction of being one of only a handful of years where the US market corrected by more than 10% two times during the year. In between these corrections there was a notable divergence in performance between domestic and foreign stocks. These inflection points divide the year and provide a framework for summarizing markets in 2018. At the start of 2018, US and foreign markets were moving up amidst a narrative of “synchronized global growth.” Emerging Markets were the most positive, up 10% in January alone. Then the party suddenly ended as two themes dominated the news cycle. Higher-than-expected rises in wages stoked inflation concerns, and the notion of a global trade war began to enter investor psyche. 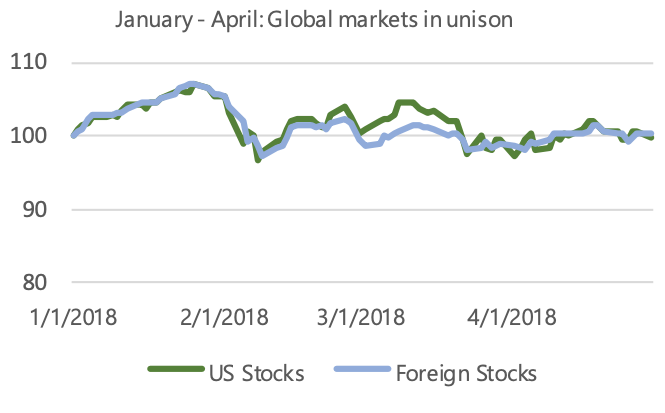 With rhetoric around trade starting to escalate, the performance of US and foreign stocks began to diverge. 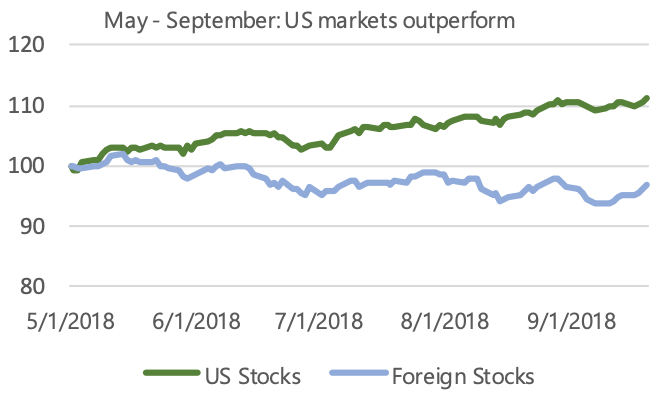 US stocks, particularly US small stocks, significantly outperformed their foreign counterparts. Many seemed to believe that the US would remain unaffected by what was going on around the world, and that economies with closer ties to China (i.e. trading partners in the Asia-Pacific region as well as industrial exporters such as Germany) would be most affected. This mood prevailed for most of the year. US stocks rebounded and rose to new highs, while foreign stocks remained down. As global investors moved money to the perceived safe haven of the US, this caused the dollar to rise in value against foreign currencies, which further exacerbated foreign losses for US investors. Emerging markets were particularly affected by this environment and were down significantly through the middle half of the year. US stocks proved resilient for most of the year and even reached record highs in the summer. However, towards the end of the third quarter, sentiment deteriorated rather quickly, and US stock prices moved downward for the rest of the year. Interestingly, very little had actually changed in the economy itself. There wasn’t any particularly bad news, but people simply began to grow nervous that the US may be nearing the end of a growth cycle and that the foreign trade challenges could be a catalyst for economic decline. Markets can be very emotionally driven in the short run, and bad moods are contagious. In a volatile year for stocks, bonds largely fulfilled their role of providing safety and income. 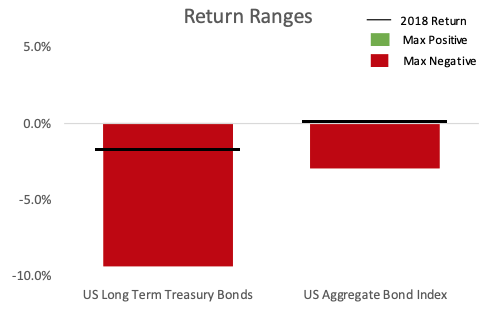 While bonds did spend some of the year with a negative return, their declines never exceeded 3%, and they actually ended the year in positive territory. People flocked to bonds as they exited stocks, and the rising bond values that resulted from this were enough to offset the headwinds of the rising interest rate environment. This is worth noting. Many falsely believe that the relationship between rising interest rates and declining bond prices is purely mathematical. However, in reality, bond prices are affect ed by many factors. Not only did bonds end the year positively, but they are now set to yield more going forward as well. 2018 was a win-win for your bond positions and also provides a good example of why intermediate term positioning is favorable. As you can see in the chart to the left, long term bonds ended the year negatively and saw a much greater range of movement throughout the year, at one point being down nearly 10%. 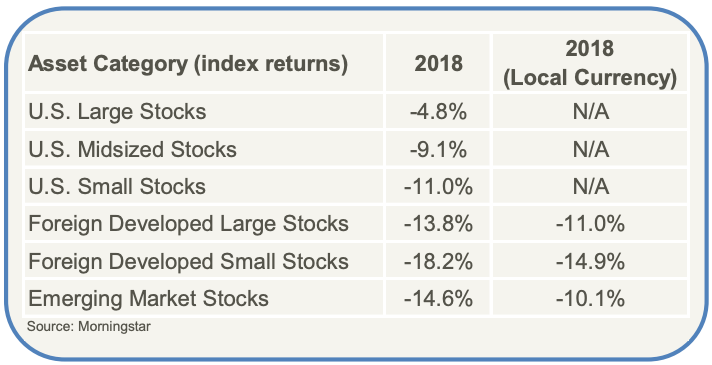 Diversifying Non-Traditional investments experienced negative returns for 2018. Our typical expectation for this asset class is to provide a stabilizing return between that of stocks and bonds, and this expectation was fulfilled this year. Trend following strategies fared the worst, as quickly changing investor emotions made it difficult to capture momentum-driven benefits. As the stock market sell-off accelerated in the last weeks of the year, these strategies did provide positive benefits, and they were poised to continue doing so if markets had continued downward. 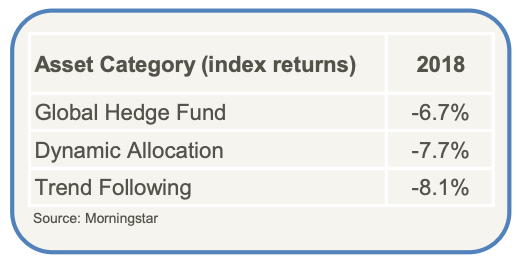 Dynamic allocation and hedge strategies were also down for the year. These strategies hold a wide range of diversifying investments, but with nearly all investment categories down for the year, they struggled as well. What can we take away from a volatile year like 2018? While the year was not fun to experience, it actually was a year that proves the merits of diversification. 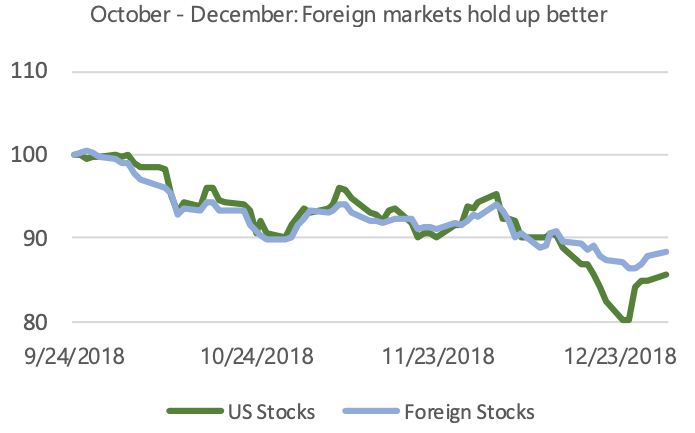 Bond stability is the most obvious highlight, but even within the stock portfolio, returns were stabilized throughout the year by owning a wide variety of US and foreign stock categories. • Global Trade Negotiations, especially with China. • US corporate earnings strength, which have been strong to-date, but may diminish as US corporations operate in a higher wage environment. • Potential changes in appetite for a small handful of the highest growth stocks. These stocks have dominated market returns over the last several years, and changes in demand for these stocks could have a ripple effect on the entire market. • Corporate and government debt levels are at high levels, which could prove to be a headwind as interest rates rise. • Our Federal Government is in a fairly contentious state at the present time. Commenting on politics is even more hazardous than trying to predict the future of financial markets, but we can safely say that seeing the government working together would likely be a positive factor. 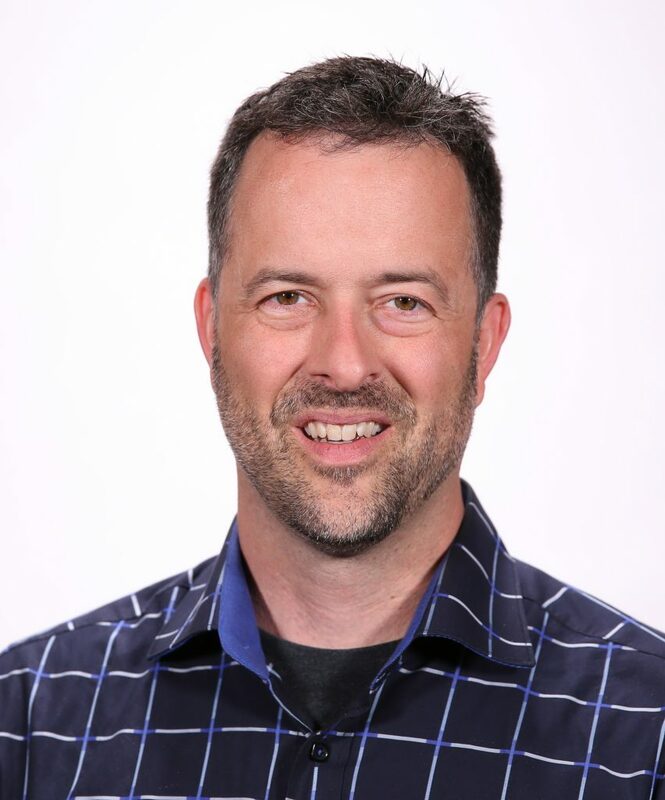 We cannot know how all of these factors will weave together to create the story of 2019. Most economists are predicting that if a recession does occur in the US, it will not begin until 2020 and is likely to be somewhat mild. Whether the pundits are right or not, markets are still likely to bounce around in anticipation. In fact, many react to the “r” word as if it is cataclysmic, likely due to the still-fresh memory of the severe downturn of 2008 – 2009. We expect any recession to be much more mundane than that, but whatever comes we will be prepared to respond. As always, we know that there will be new opportunities to take advantage of in changing market conditions. We continue to monitor your portfolios on a daily basis looking for strategic opportunities and to stay on track for meeting your goals. Indices: Global Stocks: U.S. Large Stocks—Russell 1000, U.S. Midsized Stocks—Russell Mid Cap, U.S. Small Stocks—Russell 2000, Foreign Developed Large Stocks—MSCI EAFE, Foreign Developed Small Stocks—MSCI ACWI Ex USA Small Cap, Emerging Market Stocks—MSCI Emerging Markets, US Stocks— Russell 3000, Foreign Stocks—MSCI ACWI Ex USA; Non-Traditional: Global Hedge Fund—HFRX Global Hedge Fund, Dynamic Allocation—Morningstar Tactical Allocation Category, Emerging Market Bonds—JPM Emerging Market Bond Index, High Yield Bonds—Barclays U.S. Corporate High Yield, Bank Loans—S&P/LSTA Leveraged Loan, Trend Following—SG Trend Index; Bonds: Intermediate Term Tax-Exempt Bonds—Bloomberg Barclays Municipal 5 Yr, Intermediate Term Taxable Bonds—Bloomberg Barclays U.S. Aggregate, Short Term Taxable Bonds—Bloomberg Barclays U.S. Aggregate 1-3 Yr, Short Term Tax-Exempt Bonds—Bloomberg Barclays Municipal 1-3 Yr.